This artist's conception illustrates a storm of comets around a star near our own, called Eta Corvi. Evidence for this barrage comes from NASA's Spitzer Space Telescope, whose infrared detectors picked up indications that comets were recently torn to shreds after colliding with a rocky body. 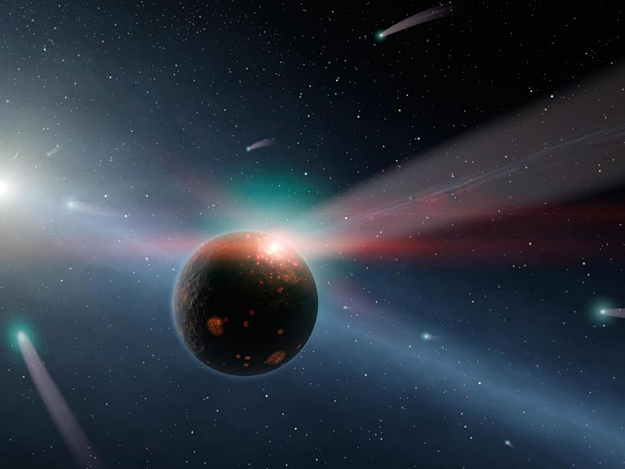 In this artist's conception, one such giant comet is shown smashing into a rocky planet, flinging ice- and carbon-rich dust into space, while also smashing water and organics into the surface of the planet. A glowing red flash captures the moment of impact on the planet. Yellow-white Eta Corvi is shown to the left, with still more comets streaming toward it. Spitzer detected spectral signatures of water ice, organics and rock around Eta Corvi -- key ingredients of comets.